Tales of sanity slowly slipping away during long nights in Lawrence Hall architecture studios are all too common to Miguel McKelvey. Take, for instance, his classmate who built a shed around his desk, took off all his clothes, and stayed inside. “I’m still friends with that guy,” laughs McKelvey. 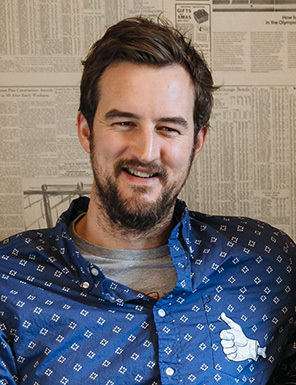 Above: Miguel McKelvey, chief creative officer of WeWork. All photos courtesy WeWork. Not only was McKelvey, BArch ’99, slogging through studio assignments, but he also was on the Ducks basketball team for two years (he rarely played, only when the Ducks were losing or winning by a lot), which meant he slept very little. At six-foot-eight, McKelvey says he stood somewhere in the median height compared to the other players. “There were so many times that I didn’t know what day it was or what time of day it was,” he says. “It could have been midnight or noon and I wouldn’t have known the difference. McKelvey says he would often sit in the studio with headphones on, listening to the same song on repeat 50 times in a row. The nocturnal work routine proved advantageous for McKelvey, who continued his nighttime productivity in the early days of his massively successful business, WeWork. McKelvey drafted WeWork’s first website, logo, and fliers in one night, from midnight to 7 a.m.
McKelvey founded WeWork in 2010 in New York City with business partner Adam Neumann. WeWork leases cooperative workplaces to many start-up businesses, freelancers, displaced workers, and entrepreneurs around the globe. 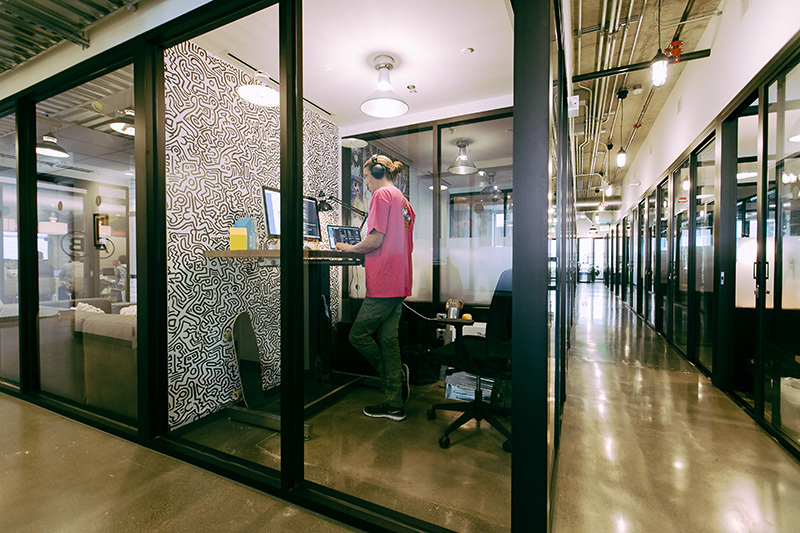 WeWork offers a tiered price-based system in office complexes that include the usual amenities such as fast WiFi and coffee, but also conference rooms, bike storage, showers, and common spaces with sofas and table games. 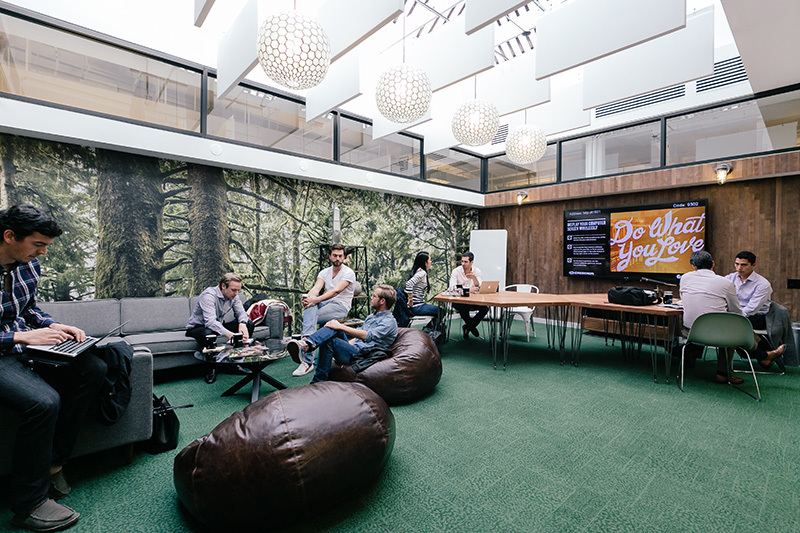 The business has grown to more than 50,000 members operating from WeWork’s seventy-seven locations, including most major US cities as well as Tel Aviv, Berlin, Amsterdam, Montreal, Shanghai, and London. Fast Company ranked WeWork No. 1 in the magazine’s World’s Top 10 Most Innovative Companies of 2015, and the company has been featured in Forbes, The Wall Street Journal, and Business Insider. In March 2016, WeWork received $430 million from Chinese investors, which will help its expansion and development of more office locations in China. But despite WeWork’s proven success, McKelvey still considers the business –valued at $16 billion, according to Wall Street Journal – to be a startup. Above: The West Broadway WeWork space in New York. All photos courtesy WeWork. McKelvey left the company to move to New York. He worked at a three-person design firm, but his less-than-glamorous responsibilities included retrieving equipment and inspecting a rat problem. McKelvey also embarked on a business project, Green Desk, with Neumann. A close precursor to WeWork, Green Desk is also a month-to-month office rental service, but McKelvey says the premise behind Green Desk is fundamentally different from WeWork, which aims to foster communities of likeminded businesses and individuals. Above: The South Lake Union WeWork space in Seattle. As McKelvey learned, entrepreneurship and architectural design are not very far apart, and the cycles of work are very similar. His long nights in Lawrence Hall studios forced him to develop a design, refine it, and iron out complex problems before presenting it for critiques. And sometimes, he says, the criticism is “super harsh.” The design process is directly comparable to entrepreneurship, he says. Kassia Dellabough, director of A&AA’s office of Professional Outreach and Development for Students (PODS), says McKelvey’s career trajectory is an inspiration to design students. Brook Muller, a UO architecture professor who served as A&AA interim dean, echoed this sentiment. McKelvey was raised in Eugene and attended South Eugene High School. He says he still pines for the Willamette Valley way of life – hiking Spencer’s Butte or Mount Pisgah, riding his bike around town, and going to Ducks football games. He loves the fall in Eugene, he says. 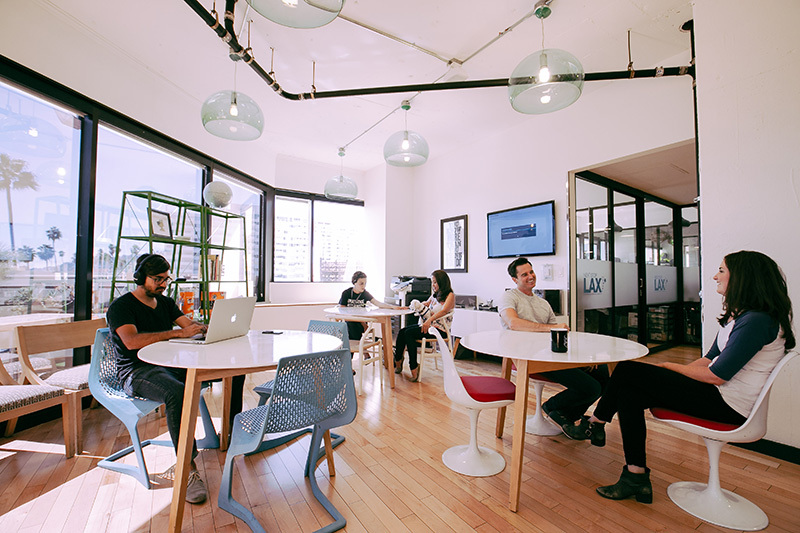 Above: A WeWork space in Hollywood.